The voice of Migszol rises like a spark of solidarity in the night of the political and social xenophobic trends that Hungary is experiencing these days. 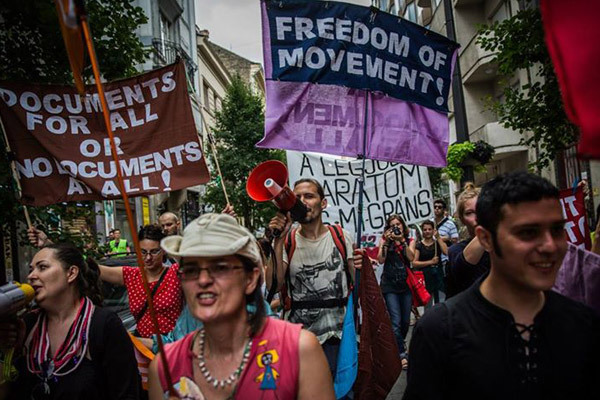 As clearly defined in their Mission Statement, the purpose of this informal but steady gathering of Hungarians, migrants and refugees is to “advocate the realization of political and social rights of asylum seekers and refugees in Hungary”. Founded in 2012 after the organization of a massive protest against the miserable situation awaiting refugees after leaving pre-integration camps, Migszol has become one of the internationally most valued voices thanks to the their prompt reporting in English on asylum issues in Hungary. Migszol’s advocacy work consists of both the organization of events and protests and the production of consultancy reports for NGOs, political parties and international organizations. Of course, their attack on the government’s migration policy is a fierce one. Since he came into power, Viktor Orbàn and his party “Fidesz” have stretched their hand to the very far-right party “Jobbik” – member of the government coalition – by radicalizing the already existing xenophobic rhetoric. The impact of what can be considered as a real institutional “hate speech” towards the migrants has worsened the situation of asylum seekers in one of the countries with the highest intake of migrants in Europe. As a clear reflection of such stance, only 544 people were granted international protection out of 42.000 asylum applications. “Hungary it’s a factory of sans-papier”, claims Annastiina Kallius, spokesperson of Migszol. But in fact, the Hungarian government is trying its best to eradicate the problem of migrants at its root: during the last month, Orbàn has announced the decisions to build a 4,5 meters tall wall along the 175 km border between Hungary and Serbia and to unilaterally suspend the Dublin Regulation. According to Annastiina, a real “humanitarian crisis” is going on in Hungary for the asylum seekers that enter the country, often willing to just cross it in search of a later permanent stop in Western Europe. The reception facilities are inadequate in number and conditions, forcing many asylum seekers to live on the streets, which would be a “mild” problem if homelessness were not criminalized in Hungary. Furthermore, a major concern of Migszol is asylum seekers detention: with nearly no social workers’ support and de facto inexistent legal help, the conditions of asylum seekers in Hungary are much worse than the average conditions of administrative detention elsewhere in Europe. Also after being given refugee status, a refugees’ life is not an easy one: the so-called “Integration Contract” – which, according to one of the greatest experts on EU asylum law Steve Peers, violates the EU Asylum regulations – grants every refugee a very small amount of money without any entitlement to receive language courses, housing help or health care provisions. If a political solution is far from being designed and implemented, then according to Annastiina the public opinion is starting to show its disagreement with the racist and inhuman treatment that the government reserves to asylum seekers. “Our protests see a quite large participation of the Hungarian population” and more and more locals show their empathy for the dire situation of the migrants providing them with food, blankets and first-necessity goods. Despite the gloomy future situation, Migszol remains optimistic about the future.